Curlicued grass yields to the cleaving plow. Earth’s warm womb swells upward for its seed. --Row upon row of proud green children. 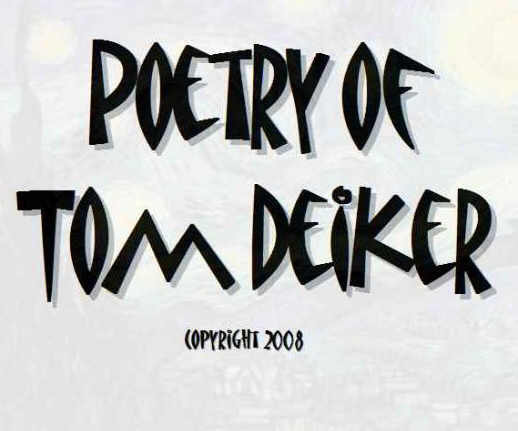 Copyright 2008, Tom Deiker. © This work is protected under the U.S. copyright laws. It may not be reproduced, reprinted, reused, or altered without the expressed written permission of the author. Tom Deiker graduated from Louisiana State University with a Ph.D in Clinical Psychology. retirement he has written and produced stage-plays in regional community theaters. Galaxy, Newsweek, The Plain Dealer Magazine, Poetry Midwest, and SNReview.